Congratulations! You’ve gotten yourself a new job; taken another step up the ladder. Time to celebrate and daydream about all the future holds for you. But before you pop that champagne, you have to resign from your present job first.Handling a resignation well requires forethought, planning and professionalism. Consider the following as you prepare to step out of one position into the next. As tempting as it may be to rush to resign as soon as you get an offer, don’t. Offers fall through, negotiations break down, budgeting gets pulled. Wait until you’ve got a signed offer letter in hand, a start date and your benefits package all figured out before letting your manager know you’re leaving. There’s nothing worse than jumping the gun then finding yourself empty handed. Before you schedule a meeting with your manager make a plan of how you intend to ease out of your position. Offer a schedule to transfer accounts, information etc… to co-workers or your replacement, and make recommendations of how best work can be reassigned or shifted. Make certain to include a road map for any unfinished projects and clean up any files that are in less than pristine shape. The first letter you’re going to write is solely for your own use. This is the letter where you air all of your grievances -- you say everything you’ve ever wanted to say. Think your present boss is a moron? Say it. Hate the way your co-worker laughs? Say it and tell them if you never see them again it would be too soon. Still angry that you were passed over for an important project? Let it all out. Now sit down and write the second letter -- the real one. Keep it short, clear and always professional. State what you are grateful for, what worked for you and what you will carry with you through the rest of your career. Be certain to say thank you, and of course include the date for your last day. And unless you’re as clever as the guy who sent a condolence card, keep it simple, straight forward and professional. Unless you work on one continent and your supervisor is on another, always offer your resignation in person. And alway schedule a meeting -- a drop in is not the way to handle this kind of information. Make sure you let your direct supervisor know first-- you don’t want word leaking out before you’ve had a chance to handle it yourself. Once they’ve been informed, ask your boss how they’d like you to manage letting other people in the office know. They may want to get out in front of the information first -- if so, respect their choice. There’s every chance that your well-planned resignation will be met with a counter-offer. And it may be sweet -- more money, added benefits, extra time off. Your boss may be very motivated to keep you around. But be wary. No matter how valued you are, you’ve already identified yourself as a flight risk, so even though the company is fighting to keep you around, they also know you’ve got one foot out the door. When the time comes for cut backs or reorganization, your name very likely will be at the top of the list. You went looking for a new job for a reason, is more money really enough to make you want to stay? Not likely. Stick to your plan to move on and up. You can read here for more about counter-offers. Your perfect resignation scenario probably looks something like this: You book a meeting with your manager, hand them your letter, offer two weeks and share a hearty handshake. You then spend the next two weeks easing the transition, saying goodbye, having your exit interview and preparing to move on. But there’s every chance that the company wants you gone that day. So be prepared, have boxes at the ready, make sure you’ve cleaned up your company computer and be prepared to be walked out by security with little time to wrap anything up. 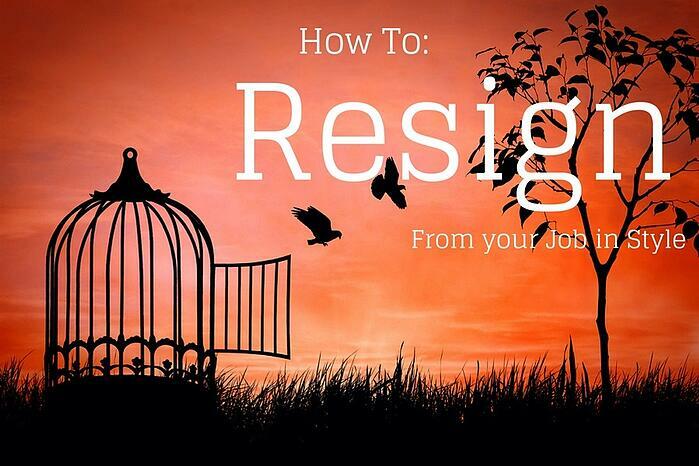 Resigning a job isn’t only about what happens next. It’s about what happens three, five, ten years down the road. You want to exit the company on a positive note. Be helpful and constructive in your exit interview, consider what you say carefully and aim to be an asset up until the end. Then say thank you and wish everyone well. If you exit on a high note, then you’ll have even more to go out and celebrate.